He was there the day that we saw that first positive test. When we danced around the kitchen, calling our families to share our exciting news, he was there. And, two days later, when the cramping began and I watched my dreams bleed out, he was there. He was there when we dared to hope again. When we saw our second chance at parenthood flutter on the screen, he was there. And, two weeks later, when we faced that screen and only saw emptiness, he was there. He was there when we said the third time’s the charm and braced ourselves for another loss. When the fear began to subside and the excitement started creeping in, he was there. 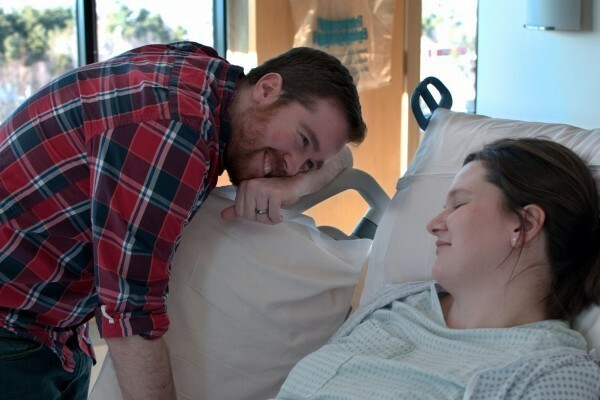 And, at 28 weeks, when they started saying “preeclampsia” and using terms like “best case scenario,” he was there. He was there through that first night on magnesium as the sweat poured down, the sickness settled in and I wouldn’t sleep because all I wanted to do was watch her heartbeat on the monitor. When everything seemed like it was going to be okay and we were preparing for her to come earlier than expected, he was there. And, 5 hours after hearing her last heartbeat, when our world came crashing down, he was there. He was there when we returned home to begin the life we never wanted. When my body was weak and I needed to be cared for, he was there. And, when we no longer cared what day it was because it meant another day without her, he was there. He was there when I said I was ready to try again. When we stood in that tiny bathroom for the fourth time staring at a plus sign that seemed more like a question mark, he was there. And, 9 months later, when we stood on the edge of a dream coming true, he was there. He was there to help me into my hospital gown and to make sure I had my slippers. When they said it was time to push and I didn’t feel like I had the strength, he was there. And, as the sun set on the last day of winter, and we heard the first cries of our second daughter, he was there. As my husband and the father of my daughters, he was there. And, he still is.